The great founder of Dutch liberty was William of Nassau, "the Silent", Prince of Orange, a German nobleman, who was born at Dillenburg in the Duchy of Nassau in 1533. He was a great favourite of Philip II, who appointed him, when 26 years of age only, "stadtholder" or governor of the provinces of Holland, Zeeland, Friesland, and Utrecht (1559). In 1561 he found himself at variance with Cardinal Granvella, whose recall he effected in 1664. When the Low Countries came into the possession of the Duke of Alva, the Spanish Governor, William at first retired to Dillenburg, but in September 1568, he embarked, with the aid of the French Huguenots, on a short and fruitless campaign the object of which was to liberate the Southern provinces. In 1571 he sided with the "Water Beggars", and in 1572 he was invited by Hollaud and Zeeland to take the command of their troops against the Spaniards. 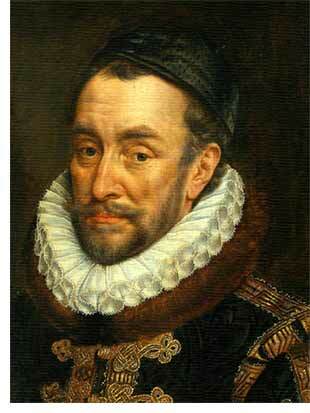 He shortly afterwards captured Middelburg, and succeeded in raising the siege of the distressed town of Leyden. On 29th January, 1579, was formed the famous defensive league of the Nothern Netherlands, known as the Utrecht Union. William was soon afterwards condemned to banishment by Philip II, but the States General bravely defied the king's authority, and in 1581 formally threw off their allegiance to the Spanish crown. On 10th July, 1584, William was murdered by an assassin at the town of Delft.